In Hollywood when you are making a movie, the working procedure is simple: you are given a script, you shoot it, followed by post-production. The system is too perfect, making the director appear to participate, if only partially, in the process of giving birth to a picture. After returning to Hong Kong, I realize that I have to start ‘fighting battles’ all over again. With my recent movies I have reached a point where I hope to use different methods to make movies. Film is a medium restricted by time; film changes with the thought processes and age of an individual. I hope that my movies may reflect two things: firstly, the environment around us, and secondly, me. The title, Time and Tide, reflects Tsui Hark’s own state of mind as revealed in the quote above. Film is a medium that relates to changes in time and place. 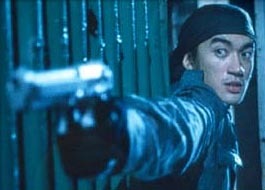 With Time and Tide, one certainly senses Tsui’s re-engagement with the Hong Kong environment and his glee in fighting fresh cinematic battles on home ground after a stint in Hollywood where he churned out two Van Damme vehicles, Double Team (1997) and Knock Off (1998), that did nothing to lift his critical stock. The title carries a tone of retrospectivity as well, and the film should remind Tsui aficionados of Dangerous Encounter – 1st Kind (1980), the director’s third film that marked a turning point in his career twenty years ago. Time and Tide now signals another turning point in the lengthy filmography that Tsui has notched up over two decades of frenetic filmmaking, both as a producer and director (see filmography). There are a number of motifs that reinforce the sense of starting over. The film begins with a monologue that sounds like a mock-up of the Creation Myth (indeed the line at the end of the monologue states that “the lord had to start all over again” having rested on the seventh day and realizing that his work wasn’t perfect). The monologue is uttered by the wet-behind-the-ears hero Tyler Yim, played by the 21-year-old Nicholas Tse, an up and coming star of both the world of Canto-pop and Hong Kong cinema. (2) Tse’s boyish look, bolstered by his trademark floppy forelocks, is a crucial signpost from the very beginning. In the fast and furious world of the Hong Kong film industry, Tsui has reached the age (he is half a century old) where he could be looked upon as Methuselah among younger-generation filmmakers. But the casting of Nicholas Tse is the first visual coup signifying the fresh spurt, a renewal of energy by the director. In another sense, Tse’s naïve hero is a throwback to the juvenile protagonists featured in the burst of energetic works that represented the Hong Kong New Wave in the period 1979-1982. These works include Tsui’s own aforementioned Dangerous Encounter — 1st Kind, Yim Ho’s The Happenings (1980), and Patrick Tam’s Nomad (1982). At the very least, Time and Tide is an evocation of these early New Wave works, reminding viewers that Tsui has lost none of his early new wave edginess, or his ability to exploit film images and all kinds of film techniques to register an awesome knock-out in the minds of his audience. In truth, there was never going to be any doubt about it. Tsui was always something of a bête noire. Hong Kong critics often describe him as possessing a “devil’s talent” (gui cai). In this context, it is appropriate to recall Dangerous Encounter – 1st Kind. Back in 1980, this was considered an incendiary film, laying bare a society where totally disaffected youth perpetrate all kinds of mayhem around Hong Kong. The original cut, completed in 1980, showed its young miscreants planting home-made bombs inside a cinema, which was enough for the authorities to impose a ban on the film. The recut version (with certain scenes reshot) that was released in 1981 still contained a bleak vision of Hong Kong youth caught in a web of anarchy and violence. Tsui evoked a kind of social determinism in the characterisations of his youthful protagonists, tracing the source of their disillusionment to the social environment in which they live: the cluttered pigeonholes of Hong Kong’s public housing apartments, for example, or the rage of young people against colonial rule. Hong Kong was portrayed as a nebulous society where terror rules and international criminals have a field day. Tsui worked into his narrative a confrontation between his young disoriented Hong Kong characters and a gang of international gun-runners and drug-smugglers controlled by American Vietnam veterans. The impact of this was a surprisingly virulent strain of anti-foreignism (or anti-Americanism) in Hong Kong cinema, not seen before or since. Time and Tide plays like a converse mirror image of Dangerous Encounter – 1st Kind, with important variations of course, updating old notions and fashions. Like the earlier film, Time and Tide features a group of foreign villains who come to Hong Kong with an ulterior motive to inflict violence on the territory, putting innocent residents in harm’s way, but Tsui has shaken off the xenophobic element present in the earlier film. His foreigners blend in with the crowd and are more multicultural (for example, they speak Cantonese, Spanish, English). Tyler Yim, the young protagonist, is a Generation Y idealist compared with the young generation of nihilists featured in the 1980 film. Having made a girl pregnant, Tyler owns up to his responsibility and finds a job as a bodyguard in a security company run by an ex-loan shark (Anthony Wong) so as to earn money for the baby’s upkeep. Tyler’s self-confidence in his own idealism is barely dented even after he is rebuffed by the pregnant girlfriend and then undergoes a passage of terror in violent shootouts. He is the most naïve of Tsui’s heroes but his naïveté is his strength. In fact, Tyler’s naïveté is a counterpoint to the attitudes of seasoned professionals around him. There is Tyler’s boss (Anthony Wong’s character), a weary authority figure spouting cynical wisdom, and then there is Jack Chow (played by Wu Bai), a Taiwanese hitman with Latin American connections, who is both Tyler’s friend and adversary and who ultimately becomes his mentor of sorts. Tsui develops their characters in such a way that they are like imitations of each other: Jack is the older mirror-image of Tyler (even to the point where they both have pregnant women to look after). From their first chance acquaintanceship, their association deepens under violent circumstances of cross and double-cross as Jack clashes with the Angels, the South American mercenaries who have come to Hong Kong to settle scores with Jack (or Juan, as they call him). The Angels’ real objective is to kill a Hong Kong godfather, who happens to be Jack’s father-in-law, and they want Jack to be their assassin, coercing him into action by threatening to harm his pregnant wife. Jack assassinates the Angels’ boss instead and then runs off with a cache of money. Tyler is present in the midst of all this action as one of Anthony Wong’s bodyguards hired by the Angels to protect their boss. Implicated by his friendship with Jack, Tyler seeks to clear himself and goes to confront Jack in his apartment, just when the Angels, led now by Miguel (played by Joventino Couto Remotigue), a memorable rastaquouère with dreadlocks, are closing in on Jack. The action unfolds in a typical Tsui Hark-on-speed manner, with Jack being both hunter and quarry, evading and attacking his opponents with a rodent-like agility, scuttling through the corridors and stairwells of the apartment building. This is an exhilarating sequence, but it is topped off by the next sequence: a darker-than-dark finale set in the Kowloon train station and the Coliseum, where Jack, the Angels, Tyler, and Jack’s pregnant wife converge. Time and Tide is even more a maze of images, more implosive in its deliberately fragmented fashion than many Tsui Hark movies of recent vintage. The director has refined a style of multi-perspective action scenes that strive to “see” the action from all angles – a style that was last seen at its best in his wuxia movie The Blade (1995). At times, he seems to be exhausting all possible means and angles to aestheticize action and violence. At other times, he risks overextending himself and becoming overbearing with his images. The fact is, Tsui is a provocateur with images, and he treats them in a highly symbolic way. For example, he appears to have a thing for pregnant women in this movie; he actually casts a pregnant woman into the thick of the action, and what is more, has the young hero deliver a baby in the midst of violence. Tsui loves cutting it to the bone, but the symbolism is all too evident: birth amidst death, hope amidst destruction, renewal after apocalypse, and so forth. It is utterly audacious, and Tsui carries it off with panache on both levels of absurdity and drama. To demonstrate what I mean, here’s a sample of the dialogue: (as the baby is delivered) “Do I use the gun to shoot the cord loose?”, to which the mother replies, “Use your teeth!”. Tsui Hark wouldn’t be Tsui Hark without this kind of stomach-churning provocation. On this evidence, age hasn’t mellowed him one bit. If anything, Tsui revels more than ever in unsettling his audience through orchestrated hysteria and violence. The same goes for his narrative structure, which is always much too complex and too convoluted for synoptic minds and once-only viewers, but admirably rich for formalists and structuralists. His narratives usually lend themselves to rich allegorical readings, and Tsui can be a very skilful allegorist when he wants to be. Dangerous Encounter – 1st Kind was an allegory about modern Hong Kong which struck home so controversially in its original cut that it was banned. Time and Tide is an allegory that attempts to redefine Hong Kong at the start of the new millennium. It is Tsui Hark’s first real post-’97 work, one which captures remnants of the dark moods of the ’80s when Hong Kong was agonizing over the 1997 question. But lest one think that Tsui delights in depicting the worst of times, he reasserts his quest for chivalry in new ways. There’s a new-found faith in gentlemanly idealism at the core of Time and Tide, manifested in the characters of Jack and Tyler: both men who seek to be independent husbands and fathers, and above all, to be responsible for their actions. Interview with Tsui Hark in City Entertainment (Hong Kong-published film magazine), no. 569, 1-14 February 2001, p. 33. Passage quoted is translated by author. Tse has also recently made his directorial debut by co-directing a segment in the multi-episodic movie Heroes in Love (2001).